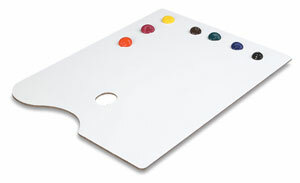 This durable artist's palette is cut from warp-resistant hardboard and has smoothly rounded corners. Its surface is coated with a tough, permanent white finish that resists stains from oil and acrylic paints and protects against absorbency of linseed oil, turpentine, and other thinners. It's comfortable to hold, with a large 12" × 16" (31 cm × 41 cm) mixing surface.